Germany's Ifo Institute reports today that its index of the business climate has risen to its highest level since 1991 - so much for what used to be the sick man of Europe. If that's one surprise, this chart is another. 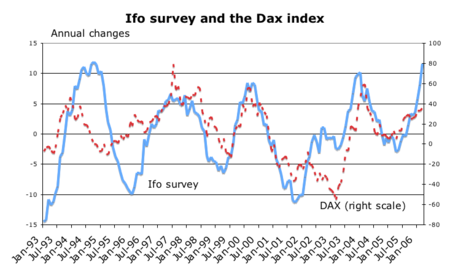 The Dax index - which supposedly contains Germany's most globalized businesses - has recently been hugely well correlated with changes in the Ifo index. This, I suspect, shows that German investors' appetite for risk is sensitive to domestic business conditions, and the home bias (pdf) causes this to raise domestic share prices. 3M ch. Dax = 2.646 + 1.55 x ch.Ifo. The R-squared is 6.2% - not bad for volatile data - and the t-stat is 2.69. Results since 1992 or 1995 are similar. This suggests the Dax is an inefficient market, in that relevant information is not discounted immediately. Given the Ifo's huge rise in the last few months, this augurs well for the Dax. Sadly, though, the predicted rise in the next 3 months - 11.6% - is smaller than the standard error in the regression (12.9%). Which goes to show that there's a big difference between spotting apparent inefficiencies and being able to profit easily from them. Ain't life rum? German cars used to be the acme of reliability; now they are far poorer than Honda or Toyota products. And yet the German economy is optimistic. Stone the crows.